If you are getting married to a Japanese national﻿ and already a lawfully registerd foreigner with mid-to-long term residence, you may find it advantageous to take a trip down to the local immigratin authorities and apply for a so-called "spouse visa." Among other advantages, becoming an offically registered spouse removes any working restrictions that a traditional visa carries. In addition, it is easier apply for permenent residency (eien jumin-ken 永遠住民権) when you are offically married to a Japanese national. Disclaimer: I am not an immigration lawyer and I am not familiar with the minuitia of Japanese immigration procedures. These findings are based soley on my own experience as a foreigner residing lawfully in Japan. First of all, the term "spouse visa," while popular in foreigner vernacular, is not technically correct. According to the letter of the law, a "visa" (sasho 査証) is only used for entering the country. After you clear the airport, you are offically granted a "status of residence" (zairyu shikaku 在留資格). Check out Steve's article on visas versus status of residence to clear up any abigous terminology. 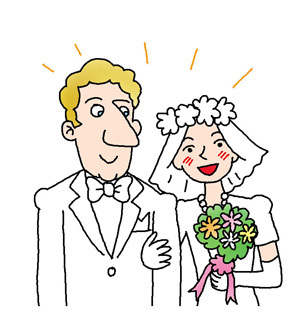 In the case of marrying a Japanese citizen, the offical status is known as nihonjin no haigusha (日本人の配偶者). The list of documents you need to compile to apply for a spousal satus of residence is a long one, so make sure you leave plenty of time for all the leg work. Also, don't forget that the all mighty immigration authorities reserve the right to request additional documents before processing your application. 4cm x 3cm ID Sized Photographs- You will need to put on your Application for Change of Status of Residence (see below). Officially you only need one but its a good idea to bring extras just in case. Make sure to write your name on the back before gluing it to your application. Like all ID photos, the photo should be taken against a plain background with only your head and shoulder visible. Hats and sun glasses are a big no-no. Application for Change of Status of Residence- A PDF version of the application (zairyu shikaku henko shinsei 在留資格変更申請) can be downloaded from the Ministry of Justice website or you can pick one up at the immigration office. Although the form looks intimidating, its basically the same immigration rigamarole with a couple of extra questions about you and your spouse's income. A Copy of Your Basic Resident Register- You need to snag a copy your basic resident register (jyumin-hyo 住民票) that lists you and your spouse. The resident register lists family relations (spouse, son, etc) so this will serve as proof of marriage. A Copy of Your Foreign Marriage Certificate- This only applies if you were legally married before moving to Japan. Make sure to bring a translation as well. Snap Shots- Here's where it gets creepy. You have to provide immigration with 2 to 3 photos of you and your spouse, "doing things that normal couples usually do"--or at least that was the definition given by my local immigration official. Try throwing in some wedding pictures to make it look authentic. Proof of Employment- If you are currently working and acting as the bread winner, you need to ask your primary employer for proof of employment. There is no set format for this but it usually has to be a stamped letter listing the length of your employment and salary. In addition, it should have an official seal or stamp from you employing organization. Proof of Tax Payment and Proof of Residence Tax Payment- In order to show that you are not a no-good tax cheat, you need to get a Proof of Tax Payment (zozei shomeisho 納税証明書) and Proof of Residence Tax Payment (jumin no kazei shomeisho 住民の課税証明書) from your local ward office or city hall. In the event you are exempt from local resident taxes (i.e. earning no income) then you need to get a Proof of Resident Tax Exemption (住民の非課税証明書 jumin no hi-kazei shomeisho). Residence tax is assessed by the city, town, or ward where you were officially domiciled from January 1st. So even if you move house in February, you will have to get your tax forms from your previous locality. Passport- Pretty basic. Don't forget it! Residence Card or Alien Registration Card- As is the case with all transactions involving immigration, bring your Residence Card or Alien Registration Card. As the Alien Registration Card is officially being abolished, you will have to fork it over once your visa is changed. A Copy of Your Spouse' Family Registration- Your spouse needs produce a full copy of his or her full Family Registration (koseki tohon 戸籍謄本). Questionaire- Although it is called a "questionnaire" (shitsumon-sho 質問書), it is more like a small essay involving various invasive questions such as how and when did you meet, what languages do you use on a daily basis, and a chronological list of the whole dating process up until marriage. Also, make sure you have all your old passports handy as you have to list every trip into and out of Japan. You can download the PDF form here. This must be filled out by hand by your Japanese spouse. Letter of Guarantee- Also known as a mimoto hosho-sho (身元保証書). This is basically a letter where your spouse agrees to take legal and moral responsibility for repatriating you if you seriously mess up. This is not to be confused with a financial hosho-nin (保証人) entourage who is legally responsible for repaying unpaid debts. The form can be found here and should be stamped with your spouse's official seal. Proof of Tax Payment and Proof of Residence Tax Payment- Same as listed above. This is especially important if your spouse is the bread winner. Even if he or she is not working, its a good idea to bring these anyways just to make sure everything goes smoothly. If you live 2 and a half hours by car from the nearest immigration bureau like I do, make sure you double and triple check to make sure you have all your paper work in order before you depart. If you are working for a company, they are under no legal obligation to give you a paid leave of absence as changing to a spousal status of residence is strictly voluntary. Remember that immigration bureaus are only open on weekdays from around 9:00am-4:00pm. Also, it is a good idea to bring your spouse along just in case any problems arise or you need help translating. If anything is unclear, call your local immigration center or ask when their consultation window is open. The immigration authorities here in Japan have a very traditional definition of what constitutes a lawful marriage. If you and your spouse maintain separate abodes with different addresses then expect a lot more trouble. Immigration officials also may call your home phone to verify you and your spouse live together. The official reason for this is to prevent sham marriages solely for visa purposes. Having a stable income is also key. If you make your dough via multiple part time jobs then immigration might take a harder look at your application. You might be asked to bring in more than one proof of income as well. Have you had any experiences, good or bad, with changing your status of residence? If so, let us know in the comment section! Thanks very much for your well written guide. Much appreciated. Thank you very much for the guide as well. Helping me a lot! Any idea how long this process takes? I read on a different site it takes anywhere from 1 to 3 months depending on how well meet the requirements and how backlogged the Immigration bureau is. I really appreciate you taking the time to list all of this out. Jesus. Great list, but where are these instructions in any official website? My two yen: I visited the immigration bureau three times to complete mine. The first visit was just informational, and only reasonable because I live close to my bureau. I asked questions about everything I would need and they listed off all of the same things written here. As a baseline, I'd lived and worked in Japan for years before getting married. We'd been living together for several years and had met each other's parents multiple times, but had only been married on paper for a few months before I turned in the application for spousal residence. x I didn't have to provide any documentation from my employer. However, on the application forms you have to write down where each spouse is employed, if employed. As far as I know, the bureau didn't even call my workplace to confirm that I really worked there, or any of the family members listed on our application, for that matter. Before the spousal visa, I was on a work visa with that employer as my sponsor, so immigration would have talked with my employer in the past anyway. x Tax documents for both the wife's income and mine. In practice, you only need tax documents for the spouse with the highest income, assuming that income could support the family alone. Since I'd gotten a copy of both, they took both, but it probably would have been fine with mine alone. x I also included a copy of a JLPT certificate to prove fluency because the wife's essay said we used Japanese at home all the time. That one was deemed unnecessary and handed back to me. My second and third visit were for handing in the application and for going in to pick up the new zairyuu card. It took about 3-4 weeks from submitting the application to getting the postcard in the mail informing me to come back and confirm my new status of residence. For reference, the officer who handled my application told me to expect it would take 2-4 weeks, and my bureau is in a regional city with probably a lot less immigration traffic than major cities like Tokyo. When you go in to submit the application, they just leaf through all the pages you've turned in to make sure you haven't forgotten anything. When you go in to pick up your new status of residence, you first go to the convenience store located in the bureau to buy a 4000 yen 収入印紙 stamp, then go to the immigration counter and hand in your passport, old zairyuu card, the notification postcard, and the stamp affixed to an A4 size form on which you write your name and the date. When they process these papers, they hand back your passport, your old zairyuu card with a hole in it, and your new zairyuu card with the new status of residence printed on it. Unlike the old days (pre-2012 :), they don't put a landing permission stamp in your passport anymore. The zairyuu card is the sole ID you carry and use to verify your status of residence. "A Copy of Your Foreign Marriage Certificate- This only applies if you were legally married before moving to Japan. Make sure to bring a translation as well." This applies even if you got married in Japan... sort of. You only need this if your country keeps a national registry of citizens' marriages. Korea and China, for example, do, so nationals from those countries have to get a copy of the certificate from their home country to prove that the marriage is on the books there. (So they get married in Japan, translate the 受理証明書 into their native language, forward that to their home country/embassy, wait for it to be processed, request the applicable document from their home country/embassy showing proof that the marriage is documented there, translate that document into Japanese, then include it in the Japanese spousal visa application. Lots of time and lots of hassle.) Some countries do not have such a process or registry! I know the US is one of them. For Canada, it depends on your province, but generally they do not put foreign marriages on their books. The embassy website for your country of citizenship will spell it out for you, or you can call them to confirm. Embassy staff are probably most accustomed to handling marriages of their citizens to Japanese spouses, so they can answer your questions best. On the other hand, some of the officers and guides at the Japanese immigration bureau seem to be more aware of this difference between countries than others, and like in my case, may give you conflicting advice depending on who you talk to. I had to get the number "4:A Copy of Your Foreign Marriage Certificate", even though we weren't married before meeting in Japan. People should be careful with this, because this step takes a long time... Other than that, great list! I'm in Japan on a tourist visa and we're going to marry this month. I wanted to ask re. employment...my wife-to-be is low/no income as a student and my work is contract based (have 2 contracts, one in English 'til 2020 and one in German 'til March 2018) - (neither by itself meets the minimum income but together they do...I have various other UK based unwritten contracts in the next dfew years too and we might just go there next year)..
My question is, after we get married and I go and apply to Immigration for a spuse visa do I need the contracts translated into Japanese? and in full 9whihc the quotes are a lot for) or can only the relevant bits be done 'offically' (ie. duration, money and not paragraphs on probation/notice etc)? Thank you for the excellent information here! I have one question which I cannot find a clear answer to through official channels - the tax situation. I am married to a Japanese national and spend about half the year in Japan. I am currently studying for my PhD and earn a tax-free scholarship & grant, and I am not employed in Japan. I will be applying for the spouse visa but am concerned about paying additional taxes in Japan for my tax free earnings in my own country (UK). I know my situation is rather specific - but basically I wondered if the taxes are kept separate between our home countries and Japan, or if they affect one another? Many thanks for any assistance provided. Hi coincidentally we went to the tax office in Ueno yesterday to see about my tax situation - we got married in September 2017 and I got a 1 year residence permit in November - all my earnings are in the UK and I don't have a Japanese bank account. In short, as such I am a non-permanent resident and I was told I don't need to any any tax. Your position sounds the same so I think there is no chance of paying double-tax. and on p3 there is a box 'scope of income subject to taxation' and as none of my income made in Japan nor paid into a Japanese bank acc. I don't need to pay tax.